Bad Harley-Davidson sales, some angry Canadians, Volkswagen staff cuts and more await you in The Morning Shift for Tuesday, Jan. 29, 2019. 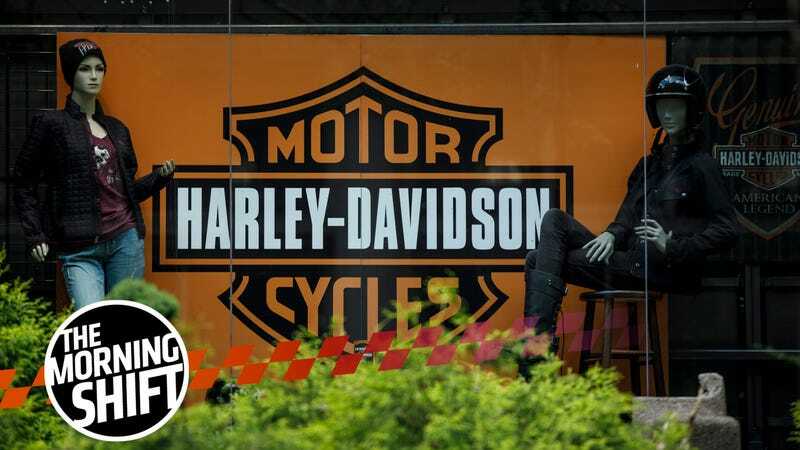 Harley-Davidson, America’s struggling motorcycle brand, didn’t have a great year last year. Sales fell again and Donald Trump’s tariffs did it no favors. World-wide sales dropped 6.1 percent last year from 2017 to about 228,000 motorcycles. In the U.S. sales fell 10 percent, but the number was lifted up slightly by stronger sales in Latin America, according to the Wall Street Journal. Additionally, shares dropped seven percent in pre-market trading. The company faces pressure as it core, older customers buy fewer bikes and younger consumers show less interest in buying its motorcycles. There is a glut of used Harley products on the domestic market, allowing buyers to pick up its signature cycles at prices that are lower than new models. The company has also faced higher costs in the U.S. due to tariffs the Trump administration implemented on steel and aluminum and said last year it would shift more production overseas to avoid European Union tariffs on its bikes. Harley has been trying hard to turn its image around. The first of the company’s new range of electric bikes, the LiveWire, was shown off at this year’s CES. It was neat but quite expensive. Yet, as reports show that more Americans are riding than ever before, and that the percentage of female riders is way up, maybe there is light for Harley at the end of this tunnel after all. Sweeping cuts were part of General Motors’ Zero Crashes, Zero Emissions, Zero Congestion plan, announced last November. The automaker plans to cut thousands of jobs and shutter five assembly plants, including the one in Oshawa, Ontario, Canada. Nobody is particularly happy about this, the Canadians included. “If it starts with 3, it’s not for me,” said Unifor President Jerry Dias during a news conference Friday morning as his union continued its fight against GM’s decision to close an Ontario assembly plant. He said GM cars with a vehicle identification number starting with “3" means it was built in Mexico. Dias is also scheduled to meet with the UAW the first week in February to discuss how the U.S. union might team up with Unifor to challenge GM’s decision to idle five factories in North America this year. If the boycott works, GM has said that it could cause “collateral damage across the wider Ontario economy, which has more than 60 Ontario-based auto parts companies supporting Mexico production,” according to the outlet. On top of that, Dias also didn’t rule out the possibility of a strike. In the union’s eyes, if GM won’t “honor the collective bargaining agreement,” then it has no reason to, either. Staff reductions aren’t just limited to GM, either. It’s happening with Volkswagen, too. Volkswagen has plans to reduce staff at its plan in Slovakia, the first time since the 2009 financial crisis, reports Reuters. This apparently is all part of an “efficiency drive” in which it aims to increase efficiencies by 30 percent by 2025 to be able to afford a pivot to electric and automated cars following that whole Dieselgate thing. The business will return some 500 workers it had borrowed from the Hungarian unit of premium brand Audi in 2016, reduce the number of contractors and will not extend expiring fixed-term contracts, it said in a statement on Monday. The Slovak business will also reduce the number of production shifts that make higher-end SUVs as well as cheaper small family cars including the Volkswagen e-up!, the only electric car currently made in Slovakia. There are no plans to place production of new electric vehicles at the Bratislava factory at the moment, it added. Around 14,000 people are employed at the Slovakia plant, but VW didn’t specify how much that figure would fall by. Volkswagen has been hard at work at its new MEB electric car platform, which will underpin a whole family of EVs from the German automaker. At the beginning of 2016, we heard that GM had a new ride-sharing service partnership with Maven. It was meant to take the hassle out of vehicle ownership. But now it seems that Julia Steyn, who headed up GM’s urban mobility branch and Maven, isn’t with the company anymore. Known as an outside-the-box thinker, Steyn had ambitions to develop Maven into a sharing platform, not just for cars. But the long-term plan for Maven, its place within GM and how to expand it into a profitable business haven’t always been clear. Steyn’s departure is not expected to impact Maven’s operations, according to the source, who agreed to speak on the condition of anonymity. In any case, Cadillac’s ride-sharing service, Book, is also apparently making a comeback, too. Looks like GM isn’t ready to let go of these sharing services just yet. For the upcoming Geneva Motor Show, Mitsubishi will show off a concept car called the Engelberg Tourer. That’s uh, that’s a name alright. The concept will allegedly bring “more SUV capability, EV efficiency, technology and style” to Mitsubishi’s lineup, according to a press release. The name comes from a “beautiful; rugged Alpine town with a history of sporting success.” Okay. Anyway, keep an eye on this space for a Mitsubishi concept car write-up. I truly hopes it does all of those things for Mitsubishi’s lineup, because it sure needs it. Neutral: Would You Buy a Harley?